Nuttall is a type of oak tree that is native to North America. It is frequently found along riverbanks and streams, in bottom land and in other low-lying areas where wet conditions prevail. While Nuttall is also frequently called red oak, red river oak and pin oak, it is a distinctly different species that is commonly confused with other oaks. Nuttall oak leaves are 4 to 7 inches long and deeply indented with between five and eight lobes. Each lobe sports several toothed points along its margin. The color of the leaves is dull green with a pale underside, turning red in the fall. The male flower of the Nuttall oack tree forms in long, drooping growths called catkins. They are yellow-green in color. The female flowers form as very small spikes were the leaves meet the branch. This tree produces acorns with a classic cap and nut appearance. The acorns are approximately 1 inch long and take two seasons to mature. The bark is gray brown and smooth when young, becoming rougher as the tree matures. Nuttall oak trees have a moderate growth rate, frequently adding up to 2 feet of new growth per year. They range from the lower portions of northeastern United States, throughout the South, and up along the west coast into the Pacific Northwest. Nuttall oaks thrive in USDA hardiness zones 6B through 8. They produce few surface roots and can be planted more closely to sidewalks, pavements and buildings than some other oak tree varieties. Nuttall oaks are deciduous, dropping their leaves in fall. Nuttall oak trees are medium to large trees that can grow up to 100 feet in height. The crown of the tree can spread to 80 feet and is rounded in shape with a moderate density and medium texture. The outline of the tree is fairly irregular. Nutall oaks usually grow from a single leader trunk with large branches spreading outward and upward. 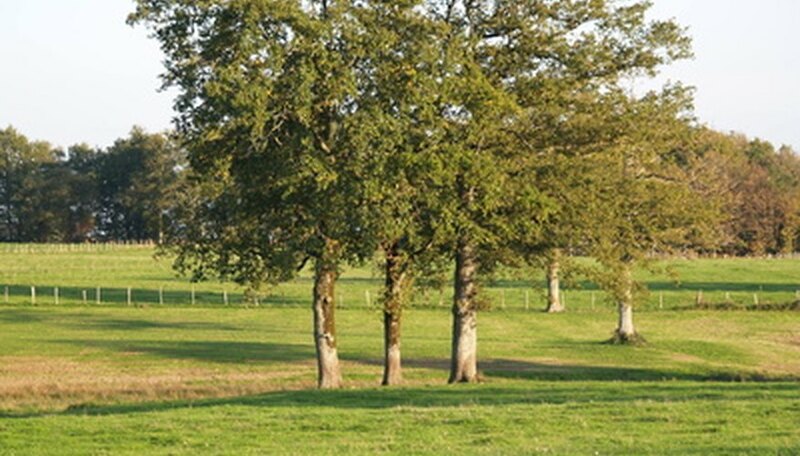 A variety of soil conditions can be tolerated by Nuttall oak trees including clay, loamy and sandy soils. They prefer acidic and well-drained soils, but they can tolerate extended periods of flooding and are moderately drought tolerant. Full sun is best. Once established, these trees require little care or pruning. This variety of oak is less available in garden centers and nurseries than other more common varieties. Propagation of the Nuttall oak is accomplished primarily by seed. The Nuttall oak is often used in residential plantings for shade and as a specimen tree in landscape settings. It can also be used in parks, to line parking lots, in median strips and along highways. It is particularly good for planting areas that are poorly drained. Nuttall oak is also an important species for wildlife management, due to its heavy acorn production, a valuable food source for squirrels, deer and other animals. The wood is commonly cut for lumber and is often sold as red oak.